How to get there: Park at the small parking lot provided at Carson Pass near Kirkwood in the Sierra Nevada. Route description: From the pass one heads south staying on the west side of the water divide. Gentle terrain (for skiing) and often with very few people! There is a clear saddle to the right of the mountain when facing it towards the east. Ski or hike to this point. Shortly thereafter it is best to leave the skies and continue the hike on foot. An easy scramble leads you to the summit, when in doubt along the way, it normally pays to keep a bit to the left on the way up. Be aware that I have never climbed here in summer, but I cannot imagine any major problems without snow. 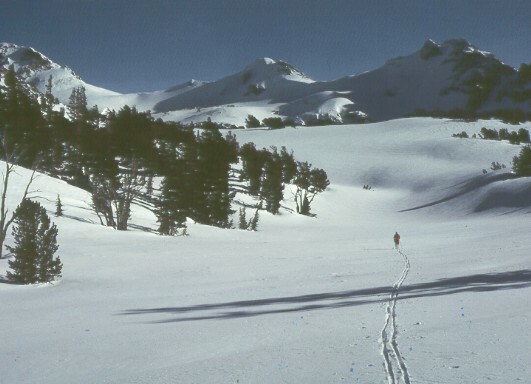 Comments: This is one of my favorite California cross country ski hikes. The trip is easily done in a day round trip. I have skied this mountain three times and my son joined me climb the summit at age 10.